Despite some missteps, I’ve enjoyed learning more about the food from other parts of the world. After our President said those horrendous words about Haiti, Africa and El Salvador a few weeks ago, I made a few calls to my Senators and Congressman to register my anger and I started looking into food as a means to learn more about these countries. This week it was Haiti. While having some commonalities to other Caribbean nations, Haiti has some unique dishes of its own influenced by its history. It is a Creole cuisine, originating from a blend of several culinary styles that populated the island, namely the French, African, Taíno natives, and Spanish. Another example of how waves of immigration influence our foods. Peppers and herbs are often used for building flavor and dishes tend to be seasoned liberally. Sounds delicious doesn’t it? I’ve yet to visit Haiti though my aunt, before her passing, participated in several medical missions after the 2010 earthquake and spoke warmly of her trips. So with her in mind, I’m going to try Pâtés Haïtiens or Haitian Beef Patties, something she talked about with great enthusiasm. Let me make this clear: I am no expert on Haitian cuisine. I’ve never made it, nor have I eaten it. My process when attempting something new is to do a lot of research – mostly internet but also cookbooks if possible – and piece together a recipe from my finds to try. Will it be good? We’ll see. Will it be authentic? Not sure though it may veer from the traditional. But I am curious and my curiosity will guide me in this venture. So here we go. I started with the pastry. It seems there are two camps – puff pastry or a short dough/pie crust made from lard and/or shortening. I’m not sure how you fall into one camp or the other but I suspect it has to do with how your family has made them. While having no family history or established preference, I did have a box of puff pastry in the freezer so I went that route. As for the filling, I read that it was a “spiced beef” filling but could use others meats such as lamb or even fish. I would think a “Haitian Beef Patty” would obviously have beef, right? So beef it was. As I was looking at recipes, I kept a mental list of what might make it “spiced” – onions likely, probably some sort of chile, garlic, acid of some sort like lime or tomato and some herbs. Thyme? Parsley? Do they use cilantro in Haiti? (Yes.) I clicked around, I read, I compared recipes and in the end chose one to start with because it sounded about right. It had all the ingredients on my list, plus I liked the addition of allspice for a deeper, warmer note though it seems Haitians might use cloves instead. I tweaked a few of the ingredients and I’m not entirely convinced the fresh cilantro or parsley in the recipe is necessary as the flavors tend to disappear in the cooked patty but you can make that call. An image search revealed the patties to be square or rectangle for the most part but I also saw some triangles and even half moons. Hmmm. 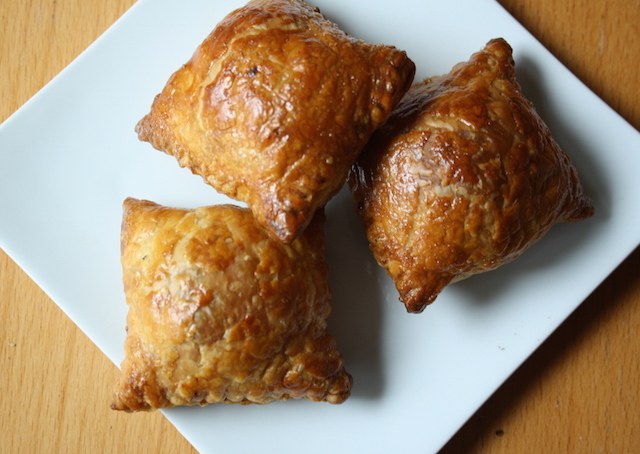 Given the shape of my puff pastry sheets, I cut it into even rectangles, place big spoonfuls of the filling on one side and folded the pastry over to create a pudgy square. A crimp with a fork to seal and a few went into the oven with a gloss of egg wash, the rest into the freezer for later. Hot from the oven, they were mighty delicious. 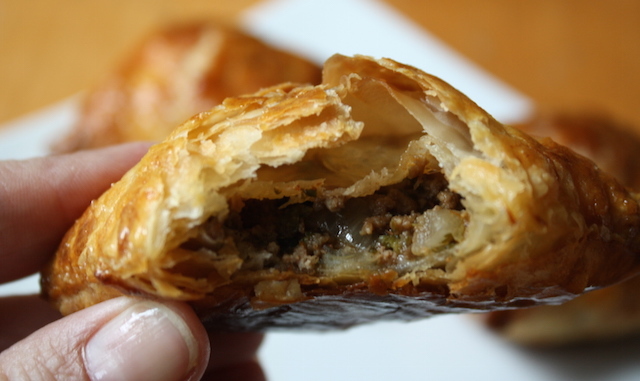 The pastry was perfectly flaky, the beef filling fully flavored. Quite nice. I had a little tomato chile jam leftover from another meal and spooned some onto one side of the pastry. Very nice! While I preferred these hot, they were also really good at room temperature. The recipe makes a bunch too – 20 snack sized – a great trick to have in the freezer, to pull out and bake off in a few minutes for a nice treat or a light dinner. I made these on the small side for an appetizer as I plan to serve them to friends this weekend, maybe with some other dishes I’m working on. We’ll definitely raise a glass to my Aunt too. I would have very much enjoyed talking about what she ate in Haiti. STRESS THERAPY BAKING FACTOR: MAKE THESE & DO SOMETHING. Learning about the food of these countries and stocking your freezer with beef patties is all fine and dandy but we also need to be active in making our voices heard regarding immigration. Contact your representation. A phone call is the best way – better than letters, emails and petitions. Easier too. Call early and call often for the best chance of getting through. I have a standing calendar reminder to make my calls every Tuesday (I’ve had best luck getting through on late Tuesday or Thursday mornings.) Sometimes you’ll be directed to leave a message rather than speak to a live person but don’t get discouraged. Keep calling. It matters – messages are logged too. While you can go through the Capital switchboard at (202) 224-3121, here’s where to find the direct office numbers: US Senate and the US House of Representatives. Put them in your contacts and call often. When I’m really fired up about an issue, I’ll call a few times during the week and I’ll call the home offices in my state too. And be sure to thank the person on the other end of the phone – they’re likely interns. Can you imagine listening to angry constituents all day long? Substitute ground lamb, pork, chicken or turkey for the ground beef if you like. For the filling: Heat the oil in a large skillet over medium-high. Add the onion and sauté until the onion is cooked through and translucent, about 3-4 minutes. Add the garlic and habanero; sauté until fragrant, about 1 minute. Push the meat to one side and tilt the pan to remove and discard any excess fat. Stir in the water, tomato paste, thyme, allspice, salt and pepper. Over medium-low, simmer for another 8-10 minutes, stirring occasionally, until all the liquid is absorbed. Remove from heat and stir in the parsley, cilantro (if using) and lime juice. Taste and adjust the salt and pepper if needed. Set aside to cool. Can be made several days ahead and refrigerated until needed. I found the filling easier to handle when it was well chilled. To assemble: very lightly flour a clean, smooth work surface and unwrap the puff pastry. With a rolling pin, gently roll out the creases in the pastry. Set the squares aside on a parchment paper lined sheet pan and repeat with the remaining sheet of puff pastry. Place on the sheet pan, separating the layers with an additional sheet of parchment paper if needed to prevent any sticking. Place the sheet pan in the refrigerator to chill for about 10-15 minutes to fully chill the pastry. The pastry is a lot easier to handle if it is very cold. Meanwhile, make an egg wash by beating together the egg and water. To assemble the patties: place a pastry square on a clean work surface and place about 2-3 Tablespoons of the filling into the center. 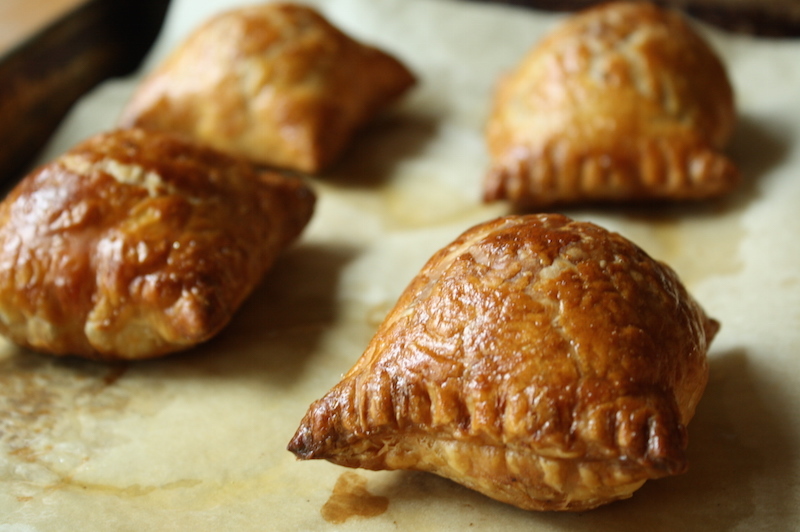 Fold the pastry in half and press the edges together and crimp the edges with tines of a fork to seal. Transfer the filled patty to a parchment lined sheet pan, and repeat with the remaining squares and filling. Preheat oven to 400°F with a rack in the lower third of the oven. Brush the patty tops lightly with the egg wash.
Bake until puffed and golden brown, 15-20 minutes (a few extra minutes if baking from frozen), rotating the pan halfway through baking. Serve the patties hot or room temperature.